Mitesh Patel, who was 22 when Young murdered his father, has anxiously anticipated those moments, as well. He wonders how he will feel when he files into the room adjacent to the death chamber and sees Young just feet away through a glass wall. For years, Patel felt a deep hatred for Young. He wanted to see him die. Patel knew it wouldn’t bring his father back. But it was part of the process that started 14 years ago when Young, then 21, gunned down Hash Patel during a robbery at Patel’s convenience store on the Southeast Side of San Antonio. Three months ago, though, his attitude began to change. He started speaking to two filmmakers who were working on a documentary about Young. He learned Young has three teenage daughters, feels deep remorse for the murder and wants to be a positive influence on children who were once like him. Patel made a decision: He wanted Young to live. Just before the murder, Young pointed a gun at a woman and raped her at her home while her three children watched, court records state. 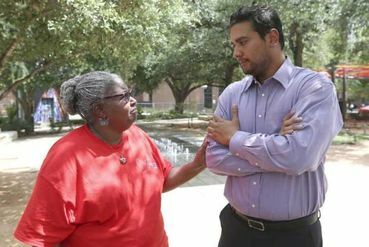 The womantold the San Antonio Express-News she’s still furious with Young and can’t forgive him — at least not yet. So are her mother and her children. Young and Patel — along with their families — hope they’ll be able to stop Young’s execution, which is scheduled for Tuesday, and reduce his sentence to life in prison without parole. Both want to work together to start a mentorship program for young men who have experienced trauma and are prone to violence or gang life. Thanks for posting Phyllis. These cases are far from simple. Young certainly wrecked havoc and created huge suffering in his own family and to the numerous people in the two other families. 2 wrongs never make a right!! Such a sad story. I hope Young gets the chance to teach others what came too late for him in a life-in-prison situation. One more murder doesn't undo the first murder, nor does it bring closure; it only will bring more sorrow, in this case even to the son of Young's victim who has forgiven him. I groan in pain sometimes with what goes on. Sometimes I prefer to put my head in the sand ~ I never do that YA KNOW!!! LOL Even to that little TomCat! smiles! The Sending stars didn't get there after that LOL I was sending stars out even to TomCat! Mucked it up! Sorry! Night Night! It is hard to forgive, but even harder to forget. I do not agree to have someoe's life taken, but on the other hand Young took a life by the choices he made, He may have remorse now of his actions but God is in charge now & the courts! Thanks Pyllis.